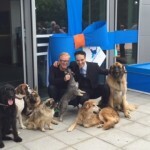 SuperVet, Noel Fitzpatrick has recently opened a spectacular new referrals centre. Noel has become known as the SuperVet for his ingenious outside the box ways of patching up our poorly pets. 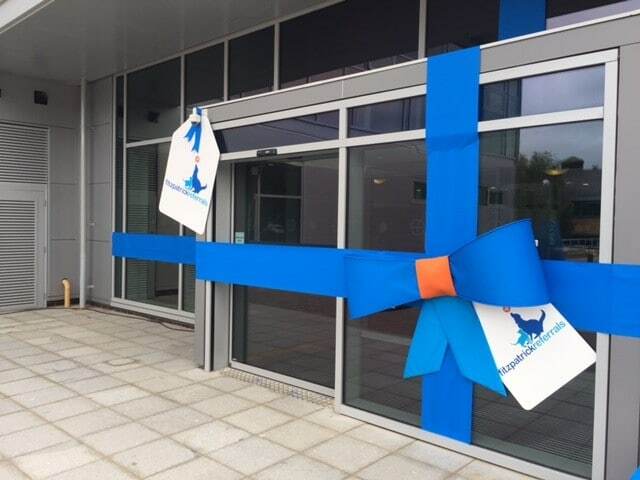 The shiny new referrals centre is a UK first in that is designed to treat cancer in our small house pets. 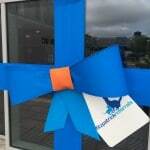 The Proflight team took a few days off from the usual work on bags and covers to engineer a big bow solution for the opening of the new veterinary referrals centre. 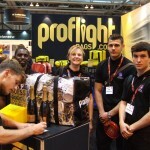 The Proflight team have created similar items before to wrap car showrooms and other buildings, usually as part of a customer’s Christmas campaign. 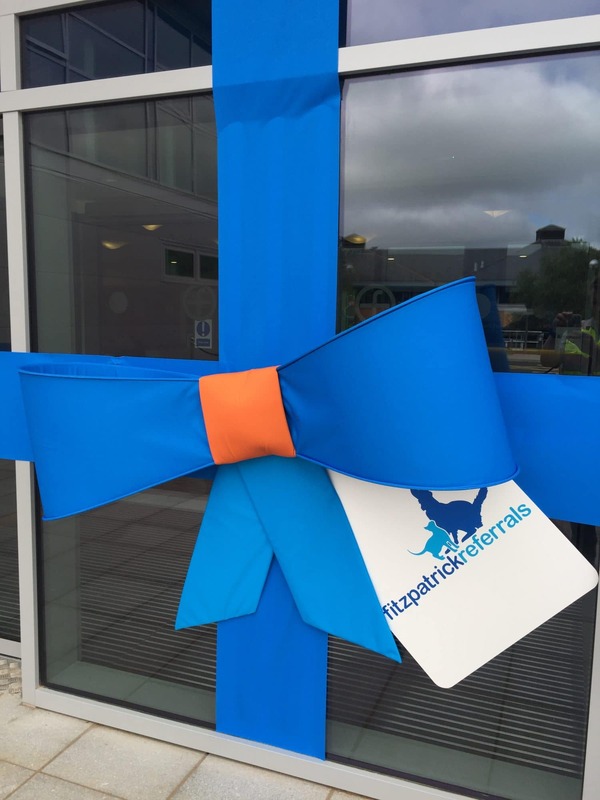 In this case the bow was made by our wonderful machinists to match the Fitzpatrick Referrals colours and with matching gift tag style label for the bow. This job caused quite a stir in the sewing room as we have quite a few animal lovers who had watched Noel in action. One of the early problems we had was achieving a good colour match for the Fitzpatrick blue. Once we had the appropriate colour and material specification we were able to begin creating the bow which will wrap the new building. 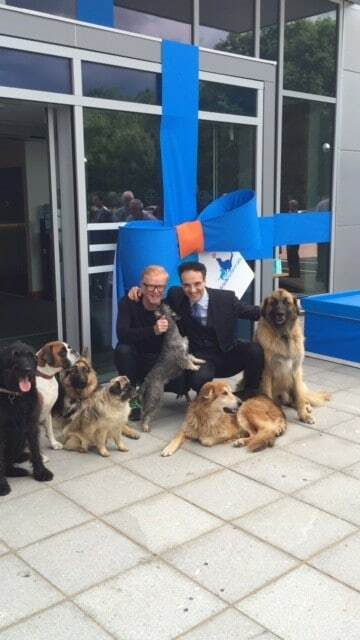 The finished bow wrapped the modern glass fronted building beautifully and provided the perfect opportunity for dog loving celebrity, Chris Evans to come and declare the surgery open. 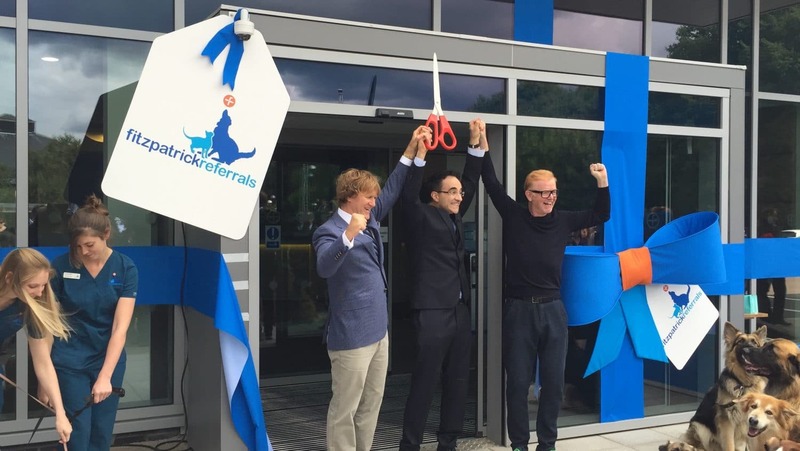 Chris Evans arrived armed with the scissors to declare the immaculate new surgery open, following a short speech Chris cut part of the ribbon to officially open the new premises. These big bow products create a fantastic spectacle and a real buzz around your event. The bow’s have been spotted at various events and are ideal for a big day… that’s why they’re big bows! 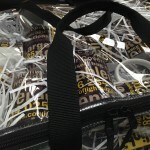 The team here at Proflight have become established in the design and manufacture of these bow’s for most occasions. 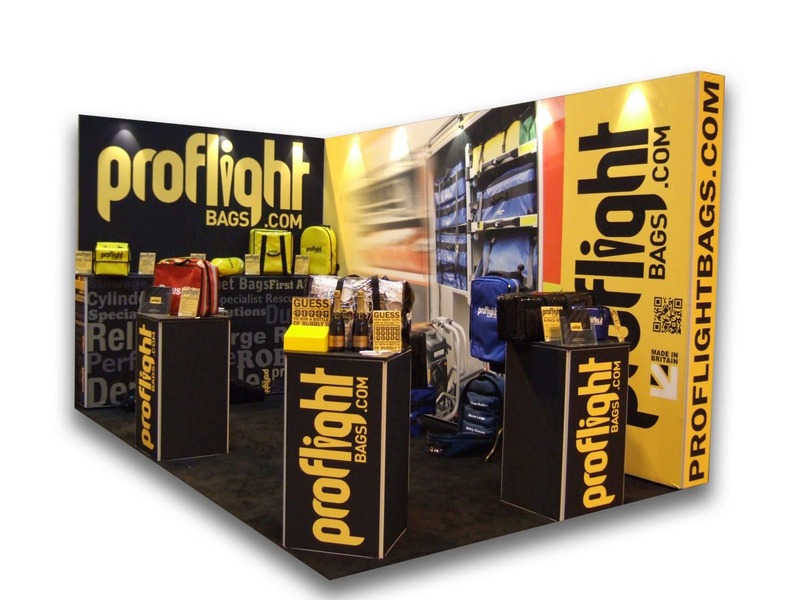 This entry was posted in Not Just Bags on November 18, 2015 by Proflight Bags. 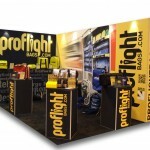 It has certainly been a hectic but exciting couple of weeks here at Proflight, after the Emergency Services Show. 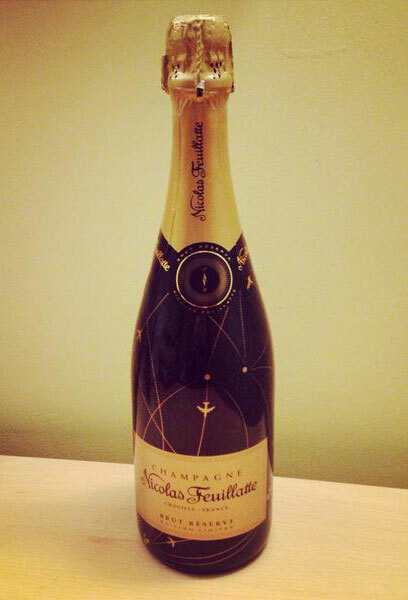 We have been able to send our congratulations to competition winners and enjoy new connections. We had a great time and really enjoyed discussing new ideas and future plans. 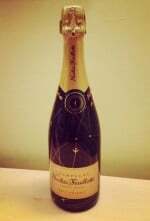 The lovely Emma, our competition winner from the Wednesday of the show very kindly let us know her her bottle of celebratory champagne had arrived safely. Along with of course her new Proflight mug! We would like to add we had not intended on drinking the champagne out of the mug, but if you want to keep it all for yourself then maybe it would be a good idea. Overall, we had a really great time at the show. We are certainly hopeful we can be there next year for more fun and competition. 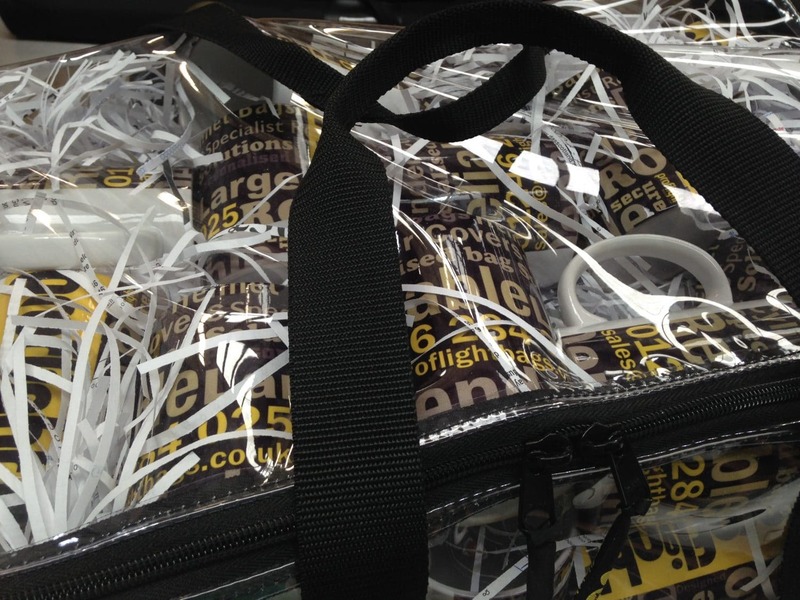 Well done and thank you to all of those who got involved and we hope your new Proflight mugs arrived safely over the weekend. 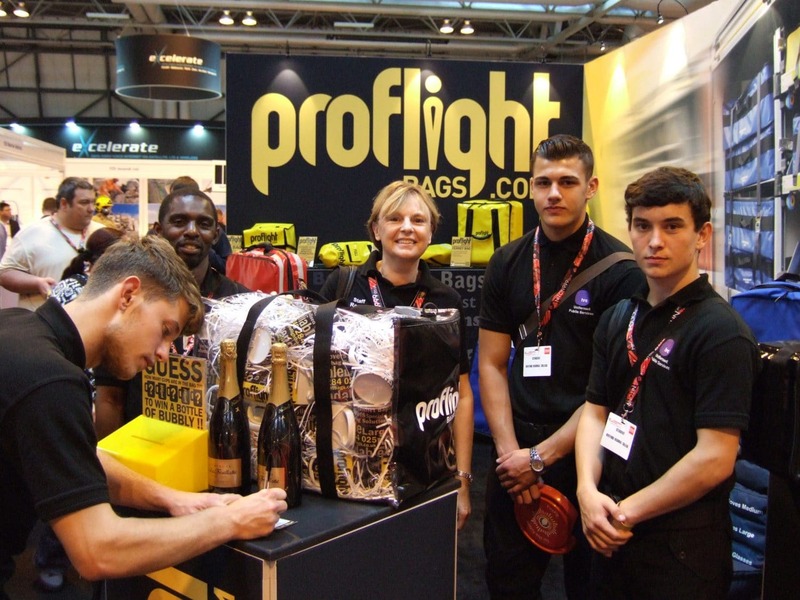 This entry was posted in Not Just Bags, Trade Show on October 9, 2014 by Proflight Bags.